Rosalind Davis and Justin Hibbs in collaboration. Saturday 29th September Closing event - Artists in Conversation with Richard Ducker 6-8.30pm. (Martin Herbert from the text ‘Between Before and After’ to accompany Justin Hibbs Exhibition ‘Alias Re-Covered’ Carroll/Fletcher 2015). Does power reside in imposing control or is it defined by allowing other voices in? Can ceding control to plurality of authorship become generative / empowering? Where and how do we draw boundaries and what might constitute a border less work? Can an enriched society exist within a context of fixed boundaries, confines and limitations? Davis and Hibbs are artists who have collaborated informally for several years. These collaborations have centred around shared themes, overlapping research interests and ongoing conversations into one another’s practices and curatorial projects. Both have independent careers but also are a couple who share a studio, where the inevitable questions arise about how and where to set boundaries. For their exhibition at no format gallery, Davis and Hibbs create an installation that brings together multiple strands of their practices into direct dialogue with one other. Within the parameters of the gallery neither artists work can be negotiated without experiencing reflections of the other within them. There is an ongoing negotiation between our perspective of being external to the structure and our bodily experience of interacting with it. 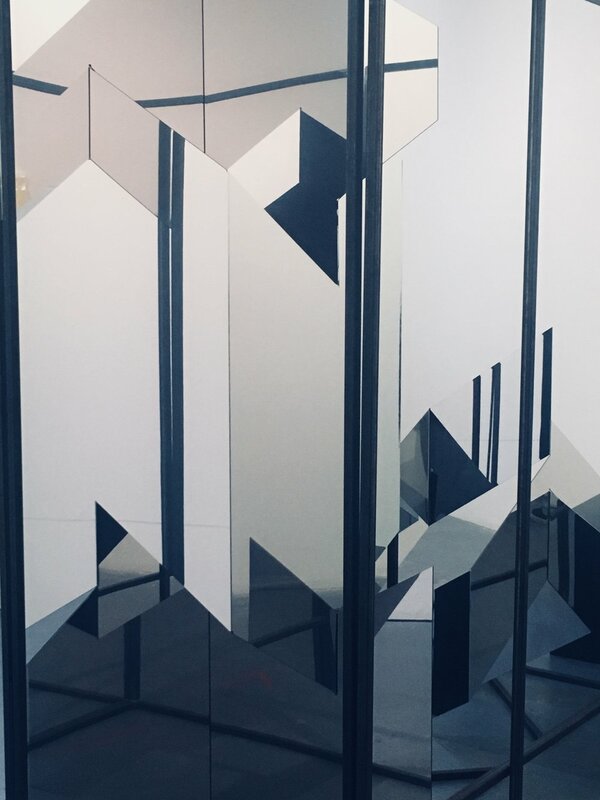 Hibbs’ site-specific installations and wall drawings play with a sense of constantly shifting perspectives that tease out relationships between the flatness of two-dimensional drawing processes and their potential for virtual projection and spatial illusionism. These installations have functioned as containers for multiple individual works and synthesise the relationships between them. The works are created through a cycle of mutations where they are reformatted, sampled and re-versioned from others, oscillating between the digital and the analogue, reinventing the legacies of modernism through contemporary tropes of mutation and reproduction. 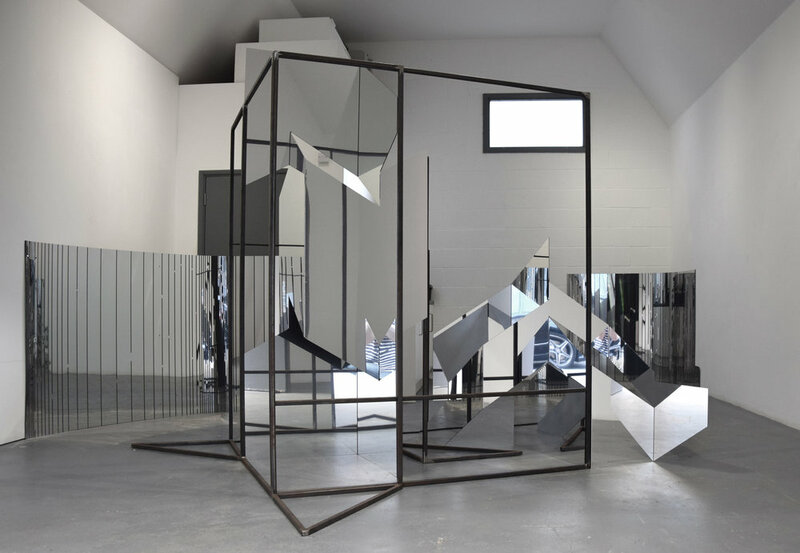 Rosalind Davisis an artist, curator and a graduate of The Royal College of Art (2005) and Chelsea College of Art (2003). As an artist Davis has exhibited nationally and internationally in a wide range of galleries and has had a number of solo shows in London: the Bruce Castle Museum (2013); John Jones Project Space; Julian Hartnoll Gallery (2009); The Residence Gallery (2007) and The Stephen Lawrence Centre. Selected group exhibitions have been at the Courtauld Institute; Griffin Gallery, Arthouse1, Bo Lee Gallery, Standpoint Gallery, Transition Gallery; The Roundhouse; Phoenix Brighton; APT Gallery; the Lion and Lamb Gallery; Parameter Space, The ING Discerning Eye; the Lynn Painters Stainers Prize, New Relics at Thameside Gallery curated by Tim Ellis and Kate Terry. Her work is held in a number of private and public collections including Soho House. She is also a member of the Undead Painters. In 2018 Davis has a solo show at Sevenoaks Visual Art Forum Gallery and in 2019 a solo show with the Foundry Gallery, London. In 2016 Davis was appointed Curator at Collyer Bristow Gallery; a dynamic gallery in a law firm and her first exhibition there was reviewed as a ‘Cracking Show. Superb Artists. Brilliantly curated’ (Art Top 10 Review) and is now curating her seventh show there. Davis had previously co-directed and developed two arts organizations; Zeitgeist Arts Projects (ZAP 2012-15) and Core Gallery (2009-11,) based in South East London. Other co-curatorial projects have been at Standpoint Gallery, Arthouse1, Geddes Gallery and with ZAP at Bond House Gallery (ASC). Between Before and After at Arroniz Arte in Mexico City (2018), Alias_Re_Covered (2015) at Carroll / Fletcher; PARA/SITE (2013) and Secondary Modern (2010) at Christinger De Mayo gallery, Zurich, Switzerland; Altneuland (2007), Lucy Mackintosh Gallery, Lausanne, Switzerland; Metroparadisiac (2006) and I'll Wait for you (2005) at the One in the Other Gallery, London. Recent group exhibitions (2016) include Shapeshifters,Arthouse1 (London) Abstraction II Arroniz Gallery/ Mexico,StrangeLands and Complicity,Collyer Bristow Gallery, Counterfitters, Geddes Gallery. London. Catalyst,Lubomirov Angus Hughes Gallery & Husk Gallery/ London (2015) Pencil/Line/Eraser (2014), Carroll / Fletcher, London; Superstructures (2013), Arronitz Arte, Mexico City; Oh My Complex, Kunstverien Stuttgart, Germany; Temples to The Domestic, Clifford Chance, London; Lost Properties, Coleman Projects, London; Polemically Small, Torrence Art Museum, California (all 2012); and Dawnbreakers (2010), Hansard Gallery, Southampton.